Rest. Relax. Satisfy your soul. Dreading it as much as dental drilling, I forced myself to go to Confession last night. During my face to face meeting with the priest (who listened intensely while I talked to my knees) I mentioned, among other transgressions, that I was finding it hard to forgive someone. 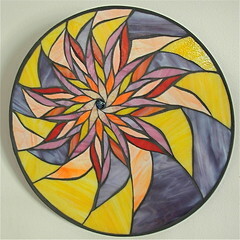 Exuding a holy, loving spirit through deep gentle eyes, he said ‘Forgiveness does not mean agreement. You don’t have to approve what happened. 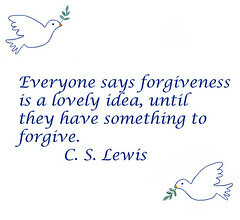 Just forgive.” To forgive, pray for the person who offended you — it helps you to let go and cuts the cord. Pray for that jerk? Ask God to be good to he who was such an idiot? The look must have shown on my face. Minimalist. But hey, it’s a start. Try it. The effect for me was immediate. My heart felt lighter; my soul felt as if a layer of dust had been lifted. Thank you Lord for a priest so full of your spirit. His irreverent humor let me laugh, and led me to pray and forgive. Amen. 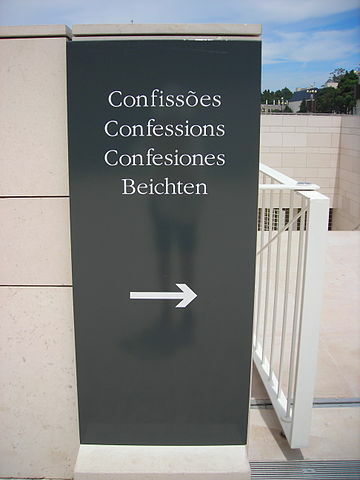 Go to confession. It’s not only good for your soul, it’s good for the jerk. The Little Books. The beauty of these small paperback booklets (published by the Diocese of Saginaw) is that the cover is completely plain: no title, no picture, nothing. No one knows what you are reading. These six minute reflections are a brilliant way to increase your knowledge and your faith, not to mention improve your life. A bargain: $3 to $4 for a single booklet or much less in volume. My church buys them and gives it away (lucky me!). Certain seasons are available in a children’s edition as well. (Note that each season is a different color, so this year Advent is called The Little Blue Book. Other seasons use a different color cover and corresponding title “The Little Purple Book” for Lent, etc.) Can you tell I like these books? They were a big help to get my prayer life moving. Pray, pray, and pray some more. Especially now: it’s Advent, it’s the Year of Faith. What are you waiting for? Although she died in 1980, Dorothy Day made the front page of The New York Times yesterday. Cardinal Timothy Dolan, Archbiship of the New York Diocese, has been talking about this divorced mother, journalist and social activist. How did a woman with a “bohemian” youth, including an abortion, who rejected religion find her way to God? And possibly sainthood? “She completely trusted God’s love for her and did not wallow in guilt over the mistakes of the past”. (Stephen J. Krupa, S.J., America Magazine) Her path to God is one of joy and love, chronicled in her autobiography, From Union Square to Rome. The birth of her daughter, Tamar Teresa, catapulted Day into God’s arms. Day was already committed to causes of social justice, labor rights, and poverty. This experience offered her another path into God. Day so identified with the poor that she co-founded the Catholic Worker Movement, and voluntarily spent her life in poverty, operating ‘houses of hospitality’ for the needy. A post-election political angle was picked up by the NY Times. Day is of interest to both poverty-motivated (left-wing) and right-to-life driven (right-wing) Catholics. Cardinal Dolan calls her a “saint for our time”, and a woman whose journey inspires. For us, her faith journey is very well documented, and an inspiration to those of us, who, like her, live in a modern world. Her faith was the basis for her life, and her life is a testament to God. 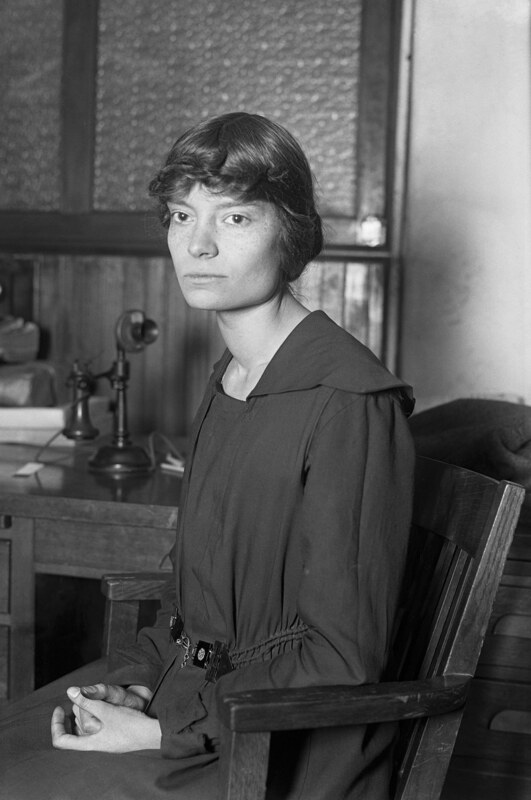 Whether she ends up titled ‘Saint’, or not, Dorothy Day is a model of strength and justice, especially in this Year of Faith. Most of us will never make the front page for our spiritual journey or charitable efforts. No need to. Our job is to keep God on the front page of our lives. In an effort to continue to deepen my faith I went to a weekday morning Mass. 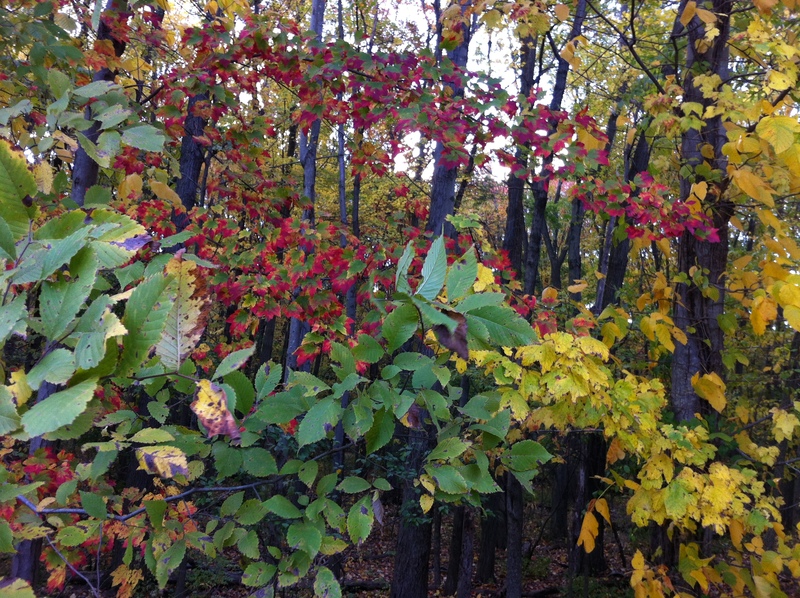 Again, I find it is so worth it — like a 25 minute power nap, except it’s full of prayer and wisdom. In doing good, and doing right, we are only doing what we are supposed to do. Sometimes the world sees that as extraordinary and tremendous. It’s not. It’s the way the world should be. As good people, people of God, etc. (describe yourself here) that’s just what we (try to) do. See the Good Samaritan for a good example. See the gospel reading here. The more I pray, the more I want to pray. I enjoy it more; I need it more. I hear more and talk less. Do good. Pray. You’ll have a better day. Promise. The thought bubbles up – this God thing. Is it real? How do I figure this out? Right now. Say something like “God, I’m looking for you. Here I am. Please help me find you.” If you’re a real skeptic, abandon your objections for just a moment and allow yourself to acknowlege that you might not know everything about the universe. Keep in mind that God is already active in your life. And he happily meets you wherever you are. Anywhere. You do not need be a saint, or a better person than you are. He is always looking for you, sending out subtle, constant invitations. So how do you hear him? Sit quietly and listen. Pray. If you feel the urge to do something that will bring you closer to God, do it. Remind yourself that you are in God’s presence and ask for his help to pray. Think over the day and remember what you are grateful for. Thank God. Scan the entire day: remember things that made you happy, stressed, confused, more loving, more selfish, etc. Where was God’s present? Where did you feel him? Where did you turn away from him? Ask forgiveness from God for your wrongdoings. Consider reconciling with anyone you may have offended. Ask for the grace of God’s help tomorrow. Remember God loves you no matter what. Close with a prayer. Christians might like to say the Our Father (as St. Ignatius of Loyola recommended in his development of this approach). Try this ‘examination of conscience’ every day for a few days. It is often easier to see God at work in your life after it happens rather than as it happens. You need to reflect on it. Surprise yourself. Read the Bible. Read whatever you want; choose wherever the page lands, or start at the beginning of a Gospel and read it like a novel. Reflect on it and listen to the persistent ideas that come to you from it. Turns out the Bible gets a bad rap. The wisdom of that guy, Jesus, who lived such a loooonng time ago is still incredibly relevant, even thousands of years later. How’d that happen, when people were writing on parchment with quill pens? If you get motivated, take a Scripture study class – the history is fascinating and can really deepen your faith and understanding. Do something kind and unselfish. Note how you feel and how it affects others. Live, for a while, as if God does exist, as if his love matters. See how it opens your heart and your mind. Know that faith and reason go together. Keep learning. Use your brain. You were made in God’s image – you know that you yourself are more than just a random life-form here on an ant-like worker colony. Emotion, relationships, love all point to something more about life that we yearn to understand and participate in. Be open to the knowledge that yes, there is more to life. But don’t be gullible. You should be able to ask questions of religion and get reasonable answers from whoever is advising you. God seeks first and foremost to love each and every one of us on earth. If it doesn’t feel that way, redirect yourself. There are lots of resources out there to learn more about God, faith and religion. A great place to start is a book called The Jesuit Guide to (Almost) Anything by Fr. Jim Martin. It’s an incredibly honest perspective from a business school grad turned priest, as well as funny, insightful, and applicable to any person of any religion. If you are a ‘lapsed’ or alienated Catholic, I get it. But now’s a good time to look again. There are very approachable priests and faith centers out there, offering open discussions about the state of the church and everything else. Finding and knowing God is not a one-off scavenger hunt event. We are like little children who must grow through learning. You can pray anytime — while driving, running, showering, washing dishes, walking the dog. Faith is like other skills – it must be nurtured and practiced and honed one day at a time. Daily Mass: I used to think this was only for the very elderly (read: on death’s door, and needing expedited clearance to heaven) or very extreme Jesus freaks. I was snared by a line I heard at school this morning: Communion will cleanse your soul. Really? Well… who doesn’t need that? Okay, I’ll go. Yes, there are a lot of elderly folks in Mass. But, they are very nice and friendly, at least in my church. And not all are about to leave this world. In today’s Gospel today Jesus calls the Pharisees ‘fools’ for paying so much attention to washing cups, plates and hands, while simultaneously harboring ‘plunder and evil’ inside themselves. “Did not the maker of the outside also make the inside?” A straightforward reminder that it is not the appearance of goodness that matters, it is the reality. If God is invited into our hearts, the goodness will be real and true. It is not necessary to proclaim yourself a ‘good’ person, just be one. It will be evident. 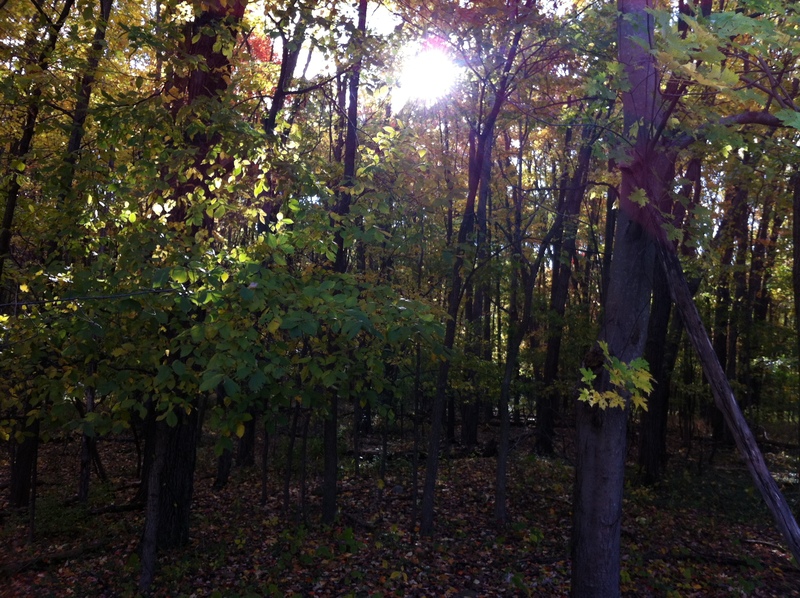 The start of my day was much calmer for this time of prayer and reflection. I really enjoyed that. And, oops, after running a few errands, then heading home I checked my calendar… I missed a coffee morning for school that I was supposed to be at after Mass. Ah, well, at least I was calm about it. My year of faith is off to a beautiful, if imperfect start. 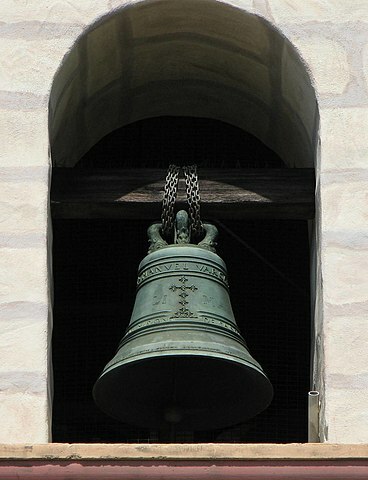 For three-minutes at noon on Oct. 11 (the first day of the Year of Faith), my children’s school rang bells and said the Angelus (a Catholic prayer of devotion to Mary and Jesus). Every child in the school – about 400 students ages 4 to 12 – encircled the entrance standing in glorious sunshine along the stone steps of the church. Together with our priest, teachers, and a few parents and parishioners, we recited the prayers. Then, with most children having brought bells to school, the student body joyously joined the three minutes of church bells. The deep resonance from the church tower echoed with sweet jingle bells, clanging teacher bells, petite dinner bells, and the giggles and jumping feet of children. What a beautiful and inspiring few moments. I can only imagine God smiling at the sight. We were reminded that our symbolic celebration was connected to the start of the Vatican II council, in which bishops paraded in to St. Peter’s under the musical might of bells ringing in churches all over Rome. In a less personally lifting experience later in the evening, my husband and I headed to a liturgy of Adoration. We thought we’d go to the service first, then out for a quick drink to celebrate a big work success of my husband’s. After struggling to settle our children, we arrived a few minutes late for the service. We snuck in through a rear side entrance, and sat quietly. We couldn’t find the program (which everyone else seemed to have), and were not near enough to peek at anyone else’s. The music was spiritual and beautiful, and my husband happily recognized one hymn from childhood. However, we couldn’t join in the recitation of the unfamiliar prayers. And as a creature of routine, not having a sense of the timing and process of the liturgy unsettled me, and I had trouble concentrating. A brief moment of awe descended on me as the congregation knelt in silence, reverently praying and looking towards the Eucharist. For a minute or two I could imagine God on the altar, here in the church, truly really with me and the power of that overwhelmed me. And then I lost it. Staring at an ornate golden structure, like a sun, on the altar (I have no idea of the proper name) I reflected that the service seemed very traditional, a bit ‘old-school’. So while I enjoyed the service, it wasn’t as helpful for me as the bells. Maybe I was distracted by my plans to go out afterwards. Maybe I shouldn’t have been late. Ah, well. If at first you don’t succeed, try, try again. I’ll keep you posted. Today I get my ‘Year of Faith guide’… Maybe that will help. Have you done anything to strengthen your faith? Has it helped? Keep at it! A Humble Man, A Jesuit, and a Pope…Is this the Start of a Joke?